2016 marks the 150th anniversary of Crime and Punishment, Dostoevsky’s first great novel of his mature period and his greatest St. Petersburg work. I invite you to join the Life Readers group at Arlington Heights Memorial Library as we read a new, outstanding translation by Oliver Ready. Through interactions between characters and exploration of various ethical systems, we will navigate the multiple levels of plot and ideas in Crime and Punishment. Readings will be supplemented by biographical, historical, and critical information, and episodes from several film adaptations. During the last session, we will discuss Crime and Punishment’s place in popular culture: its reincarnation in animations, film adaptations, comic books, graphic novels, cartoons, and tweets. Please join us for any or all sessions! Dostoevsky’s fiction captures the fluidity and instability of existence as experienced by most in any age. We will address important questions: Why do we still read Dostoevsky and why should we continue to read him if his fiction is so ambiguous? What is the real motivation for Raskolnikov’s crime, a search for which provides a greater suspense than a search for a criminal in a conventional murder mystery? Why is Raskolnikov not running away from the crime but moving towards it? How does Dostoevsky force the reader into empathy for a brutal and bloody murderer for the first time in literature? Is the Epilogue necessary, although it is often disregarded by some critics? Why do Dostoevsky’s characters both attract and repel the reader? How does Dostoevsky’s novel with its multitude of minor characters and subplots encompass antagonistic philosophies and value systems? Is Crime and Punishment a Christian novel? We will examine the polyphonic quality of Dostoevsky’s art: the presence in his texts of persistent “other voices” generated by the narrator, frequent inner dialogue, a stream of literary quotations, and allusions. We will pay particular attention to the connection between Raskolnikov and the city of St. Petersburg. St. Petersburg seemed to Dostoevsky “the most intentional and abstract city.” Disarming the reader with a seemingly exact and faithful topography, he freely moves houses, changes owners, displaces streets, and adds floors. He thus succeeds in creating a complex image of the city as a character in its own right; it does not serve only as backdrop scenery for the unfolding action, but as an active participant capable of influencing the course of events. The squalid Haymarket area serves as background to the thoughts and actions of Raskolnikov. We will examine how Raskolnikov’s Napoleonic aspirations are linked to his vision of a reordered St. Petersburg, a city reconstructed by Napoleon III and Haussman. Virginia Woolf wrote about Dostoyevsky in “The Russian Point of View” (1925): “Against our wills we are drawn in, whirled round, blinded, suffocated, and at the same time filled with a giddy rapture.” Oliver Ready’s outstanding and highly-acclaimed new translation evokes a sense of unreality, uncertainty, and indecision, where dreams and waking life switch places without notice, a unique feature of the novel. Most Crime and Punishment translations are either too tame and polished, or they are too close to the Russian and are broken by jarring literalisms, making Dostoevsky’s peculiarities of style even weirder. Ready’s translation is the closest to Dostoevsky’s style, bringing the vitality and humor of the original. I will provide comparisons between various translations by Constance Garnett, David McDuff, Pevear-Volokhonsky, and Oliver Ready and the Russian text. Literary adaptations make efforts to restructure the main concepts of novels and interpret them at the same time. Cinema keeps turning to literature, and in this seminar we will explore two different successful adaptations of Dostoevsky’s novel. While both film versions conform to the text and respect the writer, they creatively interpret the original through cinematic means. The 1970 film features some of the best Soviet actors of the time, including Georgy Taratorkin as Raskolnikov and Innokenty Smoktunovsky as Porfiry Petrovich, and it retains Dostoevsky’s epilogue. The 2007 version is known for its minimalism and visual restraint and aspires to authenticity, particularly in its depiction of Dostoevsky’s Petersburg, its color scheme, and casting actors who resemble Dostoevsky’s remarks. Svetozarov chose to omit Dostoevsky’s epilogue, making this adaptation an interpretation of the novel, rather than a mere illustration. 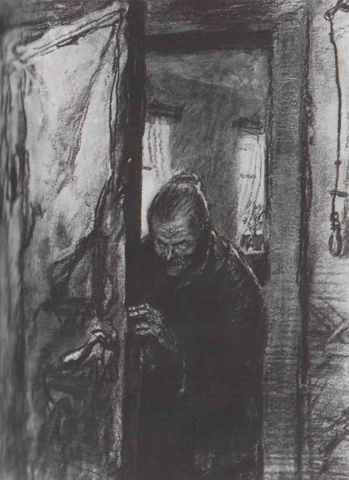 I will draw upon my Russian background to provide participants with a unique chance to appreciate some of the pleasures of the original Russian version of Crime and Punishment that are inevitably lost in any translation. We will look closely, for example, at the meaning of the Russian word “prestuplenie,” which is literally “stepping over” and means “crime,” as well as the speaking names of the characters. I will also introduce Dostoevsky’s notebooks for Crime and Punishment, which will provide a coherent account of the novel’s complex evolution.